President | Law Offices of Helen Bloch, P.C. We foster an entrepreneurial spirit in a cost efficient manner. Helping clients transition from employee to employer is one of our passions. We are a general practice firm that represents businesses and individuals in an array of matters including employment, real estate and land use related issues, workers’ compensation, business counseling, and corporate services. Outside of our employment and business arena, we defend clients in Chicago municipal code violation cases and represent others before the Illinois Workers’ Compensation Commission. We try to avoid litigation by advocating for negotiating business disputes and engaging in mediation when practicable to successfully resolve issues quickly and cost effectively. The WBAI’s core values align with mine. It is a wonderful association to meet and learn about other successful women in the practice of law. 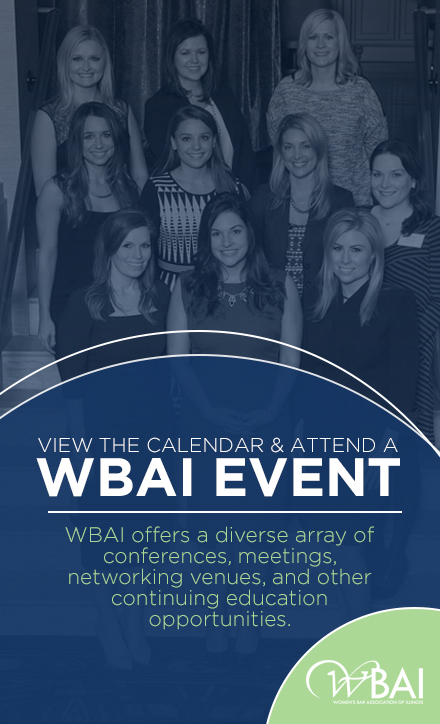 WBAI hosts many events throughout the year that I attend that promote diversity and encourage women to be thriving professionals. What is your definition of “having it all” OR What are the ways you try to achieve work/life balance? Having it all means being happy with what one has in this world. I am glad that I can negotiate disputes successfully for my clients, while actively helping my sons with their school projects. I concentrate most of my time to my business Monday through Friday, but once the weekend comes I dedicate my time to my family. What are you most looking forward to in the coming months OR 2018? I am looking forward to celebrating the ten-year anniversary of my law firm that I founded. Until law school I attended Jewish schools/University. However, I had never been to Israel even though it formed a significant part of my education. I decided to graduate college a semester early so that I could go to Israel without losing time from continuing in my studies. My journey started by volunteering in the Israel Defense Force. I was assigned to an army base in the Tel Aviv area where I packed medical supplies for 8.5 hours a day, 5 days a week. During my 3 week army volunteer service I was treated like a soldier- I slept on the base, ate my meals on the base, wore army fatigue, including used combat boots, learned how to clean a gun, and worked side by side with soldiers, most of whom were in the reserves. I even received an army ID that allowed me to travel for free on public transportation during these 3 weeks. At the end of my service I got to keep the pair of awesome wool socks I was given– they still stay up to my knees, which come in handy during Chicago winters!